Kentucky's Covington Catholic High School has reopened today after the school was closed in the wake of a controversy involving some students. 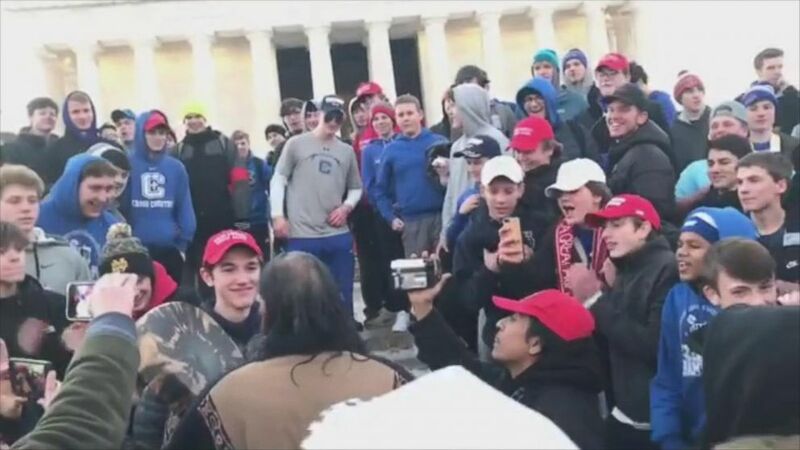 The school and its pupils came under scrutiny over the weekend when a group that had traveled to Washington D.C. to attend an anti-abortion protest were seen on video in a confrontation with Native American elders near the Lincoln Memorial. After facing security concerns in the backlash to the incident, the school principal announced in a letter to parents that the school would reopen on Wednesday. 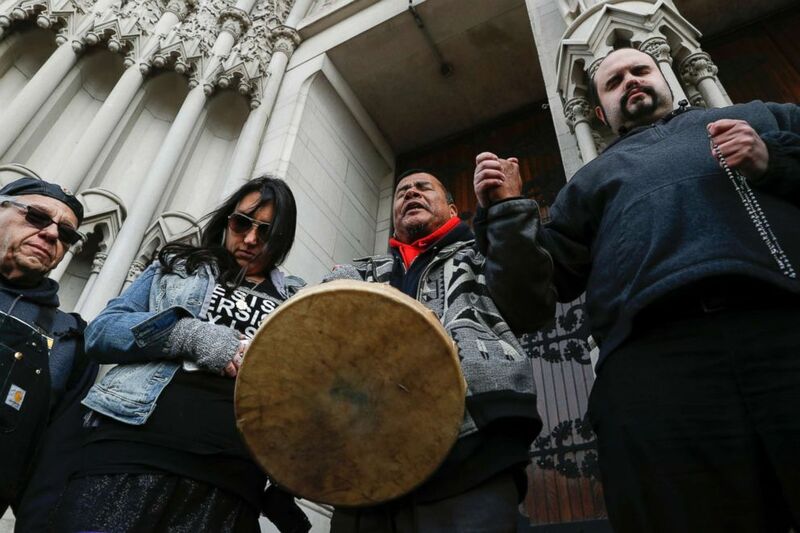 Native American demonstrators hold hands with parishioner Nathanial Hall, right, during a group prayer outside the Catholic Diocese of Covington, Jan. 22, 2019, in Covington, Ky.
"Over the course of the last four days, we have spent a considerable amount of time consulting with local officials from surrounding cities and counties, homeland security, school administrators and other safety officials regarding the situation that took place in Washington DC and the subsequent events that have occurred," Principal Robert Rowe said in a letter sent to parents on Tuesday, Jan. 22. The letter goes on to state that the start of school would be pushed back from 8:00 a.m. to 8:30 a.m., police officers would be stationed in and around the building throughout the day, and students and faculty members will be meeting "collectively and in individual classes to discuss these events and the plan going forward." A diocese in Kentucky apologized Saturday, Jan. 19, 2019, after videos emerged showing students mocking Native Americans outside the Lincoln Memorial after a rally in Washington. "Although we have done our due diligence in ensuring student safety, if you as a parent do not feel comfortable sending your son to CCH tomorrow or for subsequent days, please know that we understand this viewpoint during this difficult time period," Rowe wrote. "Please continue to pray for our community," he added. 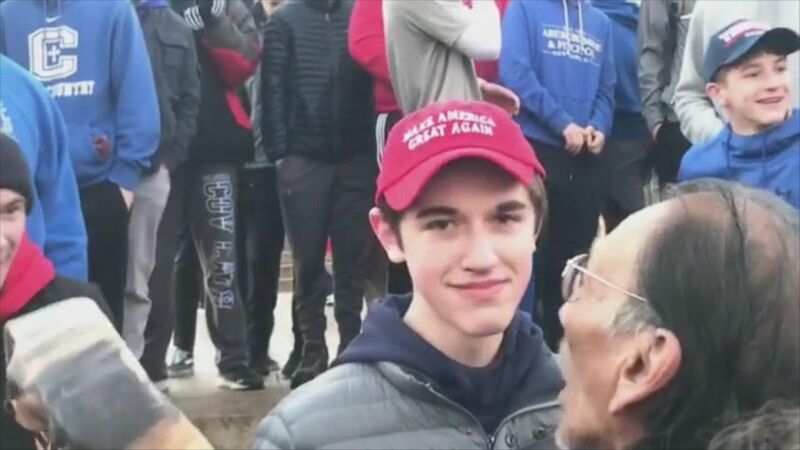 A diocese in Kentucky apologized Saturday, Jan. 19, 2019, after videos emerged showing a student in a "Make America Great Again" hat mocking Native Americans outside the Lincoln Memorial after a rally in Washington. A series of videos of the incident, which took place on Sat. Jan. 19, showed various sides of the story, with some showing one student appearing to smirk while standing facing a chanting Native American man. The students, many of whom were wearing the easily-identifiable "Make America Great Again" hats popularized by President Trump's campaign, have said that they were doing their own chants to drown out other protesters. The debate over the videos reached a new peak Tuesday when Trump tweeted his support for the students, saying that they "have become symbols of Fake News and how evil it can be." Nicholas Sandmann, the student at the center of the controversy, told "The Today Show" that he was confused by the Native American elder, subsequently identified as Omaha Nation elder Nathan Phillips. "I wanted the situation to die down and I just wish he would have walked away, but I knew as long as I kept my composure and didn't do anything that he might perceive as aggressive or elevation of the conflict that it would hopefully die," Sandmann told "Today" in a segment that aired on Wednesday. In an interview with "Good Morning America" on Tuesday, Phillips said that he felt the students were mocking Native American culture, and he questioned why their chaperones didn't take action to stop the teens. "I wish those chaperones and those teachers would have said this is the wrong behavior for American students to be displaying in our nation’s capitol," he said. "Where were those teachers, those chaperones? Those kids shouldn't have been exposed to this backlash."